First 3 bands for BIMFEST 2014 announced! Early Bird ticket sales started! We are proud to reveal to you our first 3 BIMFEST XIII live acts! Indeed, you read it well! The legendary Electro/Alternative cult formation of the former Yugoslavia (Now Croatia/Slovenia) is back! Borghesia is alive and kicking with their brand new album 'And Men Created God', an album that will be released one of the biggest American and alternative labels, Metropolis records. This Swedish Minimal/Electro/Wave/Synth/Pop was already on our wish-list for some years now so we are delighted that they finally will be a part of our BIMFEST legacy. ASG are know for their highly energetic and stunning live shows so don't miss out on them! 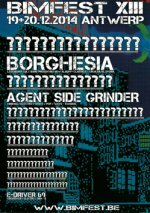 This Berlin/Erfurt based EBM/cross-over combo is already around since 1991 and this will be their first ever concert on Belgian soil. Check them out! Click the link below to confirm your BIMFEST participation! The countdown has begun! BIMFEST 2014 on December 19th + 20th! Here's the news you all have been waiting for! BIMFEST 2014 will take place on December 19th & 20th. While the BIMFEST 2014 website is still under construction the line-up will be announced bit by bit on this site and our facebook pages. However our preliminary artwork might give some of you already a clue of one our headlining bands. Early Bird tickets are already available! Order now and save lot's of Euro a ticket! Attention! Only 100 Early Bird tickets will be available! Stay tuned! Support your scene! And spread the virus! Go to our facebook event page and share this event amongst your friends! ELEMENTS were founded in 2011 in Brugge, Belgium. They are a continuation of the legendary new wave band RED ZEBRA, with bass player Sam Claeys on lead vocals. Johan Isselée (drums, synths), Geert Maertens (guitar), and Chris 'Hazy' Deneve (guitar, synths) complete the line up. Sam's melodic and eclectic vocals, as well as the landscaping synths layered on the repetitive (Red Zebra) drums and guitars, created a novel and interesting, but foremost beautiful, electro & guitar wave sound. 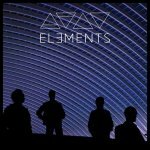 ELEMENTS produce a magnificent modern sound with a melancholic feel.
. With ELEMENTS these Ex-Red Zebra men are ready to dwell across Belgian and European roads again. 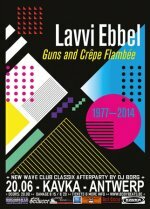 Lavvi Ebbel was without doubt one of the most controversial bands of the Belgian New-Wave movement. In the early '80, the band gained the attentions of many with their successful singles like 'Give Me a Gun' and 'Victoria'. The band soon gained a solid live reputation and combination of guitarists (Marc De Wit and Chris Van Ransbeeck), pianist (Bea Van Ransbeeck), drummer Eric White, singer Luckas Vander Taelen, backing vocalist Kristien D' Haeger, backed by the brass player Jan Weuts gave them an unique and original sound. Lavvi Ebbel played 'only' 200 times in Belgium and the Netherlands , both in small clubs and at prestigious festivals such as Seaside. On the compilation album 'Get Sprouts' which was a true sample of the music from that period Lavvi Ebbel released 'No Place To Go', a highlight in collaboration with producer Jean-Marie Aerts. 'Albu Meth' is probably the most famous mini-LP, with the cult song 'Le Cafard'. The group ceased to exist in 1983. Now, 30 years later Lavvi Ebbel is back in the original line-up, reinforced with Kloot Per W on bass. In the spring of 2014 Starman Records releases a compilation LP / CD with the greatest hits of Lavvi Ebbel, live recordings from 1983 and 2013, as well as a rousing remix of "Victoria" by none other than Buscemi. Get your tickets now on the link below! On Friday 28th of March Dive & The Juggernauts will be performing at the renowned 3rd Out Of Line Weekender festival. 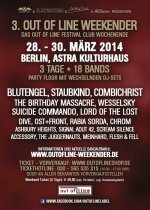 In 2012, Dive already played the 1st edition of this festival while promoting the Dive -Box, a limited edition 8CD book/box collectors item, containing the complete back-catalogue which was released on Out Of Line and sold-out quickly. The Juggernauts played the OOL festival already last year, promoting their first ever release, the limited edition Digi-pack EP 'Phoenix' on 666 numbered copies. Also their release was almost sold out within the year. This year, Out Of Line decided to make the first nigh of the festival an almost Belgian Band exclusive one! Other bands performing on Friday night 28th are Suicide Commando and Signal Aout '42, all signed to Out Of Line.